The Schneider Family Book Award is celebrating its tenth anniversary! Since 2004, the Schneider award has focused on highlighting the best pieces of literature that “embodies an artistic expression of the disability experience for child and adolescent audiences.” An author or illustrator can be honored and there are teen, middle school, and children’s awards. One of my favorite books, Hurt Go Happy won in 2008, and I am so excited to share it with you today to help celebrate the award’s anniversary. I know that many teachers have gotten away from class novels over the years and lean more towards books of choice all year long with some read alouds along the way. Although I mostly believe in this as well, there was are a couple of novels keeping me from completely abandoning a class novel, specifically Hurt Go Happy. This is one of the those books that I finished reading, and I knew right away that I had to share it with anyone who would listen. Luckily, each year I have a bunch of middle schoolers that will listen, so I started reading this novel yearly with them. Goodreads Summary: Thirteen-year-old Joey Willis is used to being left out of conversations. Though she’s been deaf since the age of six, Joey’s mother has never allowed her to learn sign language. She strains to read the lips of those around her, but often fails. Everything changes when Joey meets Dr. Charles Mansell and his baby chimpanzee, Sukari. Her new friends use sign language to communicate, and Joey secretly begins to learn to sign. Spending time with Charlie and Sukari, Joey has never been happier. She even starts making friends at school for the first time. But as Joey’s world blooms with possibilities, Charlie’s and Sukari’s choices begin to narrow–until Sukari’s very survival is in doubt. Why is this novel so important? One of the things I think is so important during the middle school years is to talk about empathy and caring for others. We read The Lorax to talk about caring for the earth, we read Each Kindness to talk about treating each other with kindness, we read The Dot to discuss open mindness, we read Endangered to build our world view, and we read Hurt Go Happy to talk about empathy for animals, children, and for people with disabilities. Hurt Go Happy truly pushes my students to think more about how their actions effect everyone around them. The book truly puts them in Joey’s shoes and Joey goes through so much in this book. Through our reading of this book, we grow even closer as a community of readers. While reading we discuss deafness, sign language, chimpanzees, abuse, research facilities, animal abuse, wild animals as pets, survival, parents, school, death, fear, and their future. The conversations get so deep. Much deeper than you would ever expect from middle school students. Why did was this novel honored by Schneider? Not once in this book do you think Joey is incompetent because of her disability. Although her mother may try to keep her from growing, she has learned how to survive and succeed in the world she lives in. Joey may seem like a normal kid, but she is more than that. She has learned to live in a world with no sound without really, truly being able to communicate. Then when ASL is introduced into Joey’s life, you begin to learn how intricate of a language ASL is, and the reader begins to build even more respect for the deaf. In My Classroom: This book gives me opportunities to work with setting, characterization, cause/effect, prediction, compare/contrast, sequence, and analogies. I try to avoid making the analysis of the book tedious, so throughout we discuss the story as needed and make predictions. We also complete Thinking Maps (a type of graphic organizer) looking at the characterization, plot development, and specific events throughout the book. I found that stopping sometimes and having these discussions helped ensure my students are comprehending and thinking about everything that is going on. Since Hurt Go Happy deals with some tough subjects, and subjects many of the students have never even thought about, it is important to talk about them. We also discuss our essential questions throughout: “Do you think animal testing is necessary? Defend your answer.” and “How would being deaf affect your life? How does it affect Joey’s?” Both which lead to some debate and, once again, deep discussions. 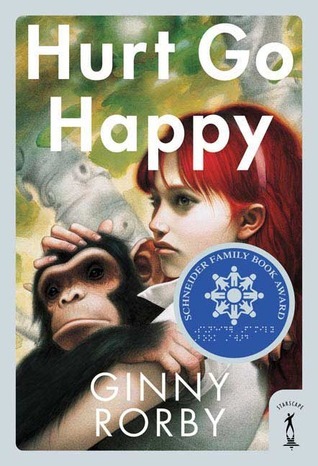 Following the reading of the novel, my students are lucky enough to be able to take part in an interview with the author of Hurt Go Happy, Ginny Rorby. The students generate the questions, vote on which ones to ask and even ask her the questions. Ginny even allows us to send her extra questions and answers them for my students. Often times, this is the first author my students have ever interacted with, so this becomes a very special moment for them. Ginny was actually able to come visit my school once as well. See how amazing an experience that was here. The part that really makes students connect to the novel is the field trip that we go on. At the end of the book, the setting changes to a rehab facility called The Center for Great Apes (@CFGA) which, while in the book was in Miami, has moved to Wauchula, FL which is 90 minutes from my school. In the book, you even meet Noelle, a chimp who knows sign language, Kenya, another chimpanzee, and Christopher, an orangutan, who are actually at the center. It is an amazing experience to take the story and turn it into reality. Hurt Go Happy is a book that I feel not only bring our class together but teaches my students some of the most important lessons for life: to care about every living thing. Thoughts from the author: I am lucky enough to call Ginny Rorby a friend. We met at a signing at a Barnes and Noble here in Orlando, stayed in touch through me teaching her book, and soon moved to friends. She is an amazing person, and such a talented author. Today I am happy to share with you Ginny’s thoughts about winning the Schneider. 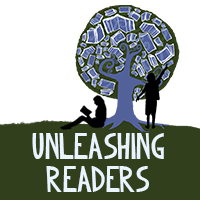 Unleashing Readers: What’s your best memory from winning a Schneider Family Book Award? UR: What did winning a Schneider Family Book Award mean to you? GR: For the first time in my then two-book career I could legitimately be referred to as an award winning author. There was a ten year gap between the publication of my first novel, Dolphin Sky, and Hurt Go Happy. The Schneider Family Book Award made me feel credible, and literally gave me the courage to keep at it. UR: If Joey was alive, how do you think she would respond to knowing her story was honored? GR: As long as kids are still reading Hurt Go Happy, Joey is alive. But if we could ask her, I think she’d say it wasn’t just her story. It was Sukari’s, too. She’d be happy to know that well over a hundred thousand kids have had the opportunity to rethink our treatment of animals, and each other. She’s glad for that. UR: Why did you decide to make Joey deaf, and what did you do to prepare writing a story about her? GR: Hurt Go Happy is about how closely related child abuse is to animal abuse. For Joey to soar above her disablity, she had to be tougher than the world around her. Her love for Sukari gave her the strength to reach her full potential. In essence, Joey and Sukari rescued each other. I went back to college when I was 33. If I’d known that it would take me 8 years to finish, I might never have started. To educate myself enough to write a believable deaf character was a lot like that. I began by taking ASL classes followed by reading everything I could find written about being deaf and raising a deaf child. I watched every movie with a deaf character. It took years longer than I would have ever dreamed. Worth it? Absolutely. Would I do it again? Probably not. But then again, my love for Joey and Sukari gave me the strength to reach my full potential, too. UR: Anything you’d like to say about the Schneider Family Book Award on its 10th anniversary? GR: I truly believe that HGH is still being read and taught in schools across the country because of that award. It was an honor to receive, and I’m forever grateful. The beautifully framed award is hanging on my book case. Whenever I feel like I can’t write one more real emotion, I’m free to glance at it and remember that I did and I still can. UR: Thank you Ginny for taking part in this celebration of the Schneider award and Hurt Go Happy! Giveaway: To help celebrate this special anniversary, one person can win a set of all 3 Schneider Family Book Award Winners from 2014. Participants must be 13 years or older and have a US or Canadian mailing address. Keep honoring such amazing books as this one! I’d love to win the Schneider Family Book Award Winners from 2014. Hurt Go Happy sounds like a wonderful book I am just being introduced to on your blog. It is an amazing book! Ginny is a long time friend who I met through several of her Winter Park High classmates of many years ago. I love all her works for young people and am delighted she is still committed to providing more books for these emergiing readers, who may become writers one day. Thank you for honoring Ginny! I bought this book many months ago when you first featured it on your blog. I bought it because at that time we were first learning that my baby niece is deaf. The book is still sitting in my TBR pile, and it’s one I need to read! Thank you for bringing it to my attention then, and bringing it up again for more readers now! You will love it Michele, and with your niece, you will definitely connect with it (though Joey’s situation is very different). It is powerful and a wonderful story.